But if you stay in just those cities, you’re missing out! The Nordic countries are big and beautiful, and much of our beauty can be seen miles and miles away from the nearest urban city. 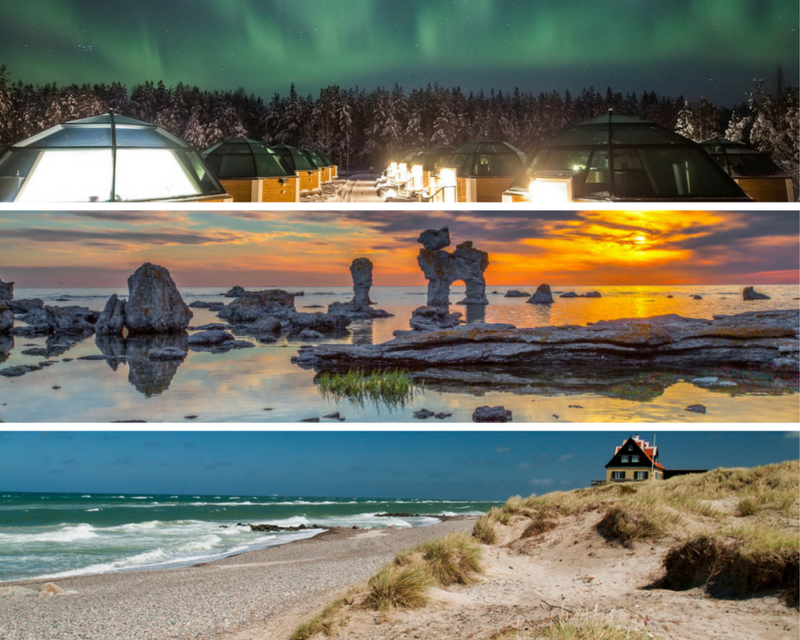 If you love outdoor activities, fresh air, and you want to go where the Scandinavians vacation, we got some recommendations you might like! Here are 5 amazing destinations that will show you the pure northern nature. Get inspired for your next Scandinavia trip! Idre has an amazing skiing resort in the wintertime and hiking trails in the summertime. You can also experience parts of the Sami culture, which is the Nordic indigenous people who has their own language and are known as reindeer farmers. You can also find this culture in Norway, Finland, and Russia. You can visit a Sami village all year round, and plan your visit here: http://renbiten.se/en/arrangemang-2-3/2110-2/ there are different packages to choose from depending on what you want to experience. You can go on hikes together with domesticated reindeers or enjoy Sami food cooked over open fire while listening to stories about the sami culture. Idre Fjäll is the skiing resort and you can find all information here: http://www.idrefjall.se/english.html you can rent all your equipment like skis, helmets, ski boots, bicycles etc, and they have accommodations for all preferences. Enjoy a full day of skiing at Idre Fjäll and take a break in one of the restaurants up on the mountains. At Restaurang Utsikten you can rest your legs and enjoy warm food like spaghetti bolognese, goulash soup, hamburger, or maybe just a hot chocolate? Charlies is the best place for after ski! They also have a great menu with a lot of options for the hungry ones like Schnitzel, Fish & Chips, Gyros etc. If you visit a Sami village you should try the reindeer meat. Renbiten has their own produced meet and stomp (the national bread in Idre). The easiest way to get to Idre is to hop on a flight to Stockholm. From there you can either take the train, which can take around seven hours, or you can rent a car and drive there which will take you approximately six hours. A true winter wonderland! 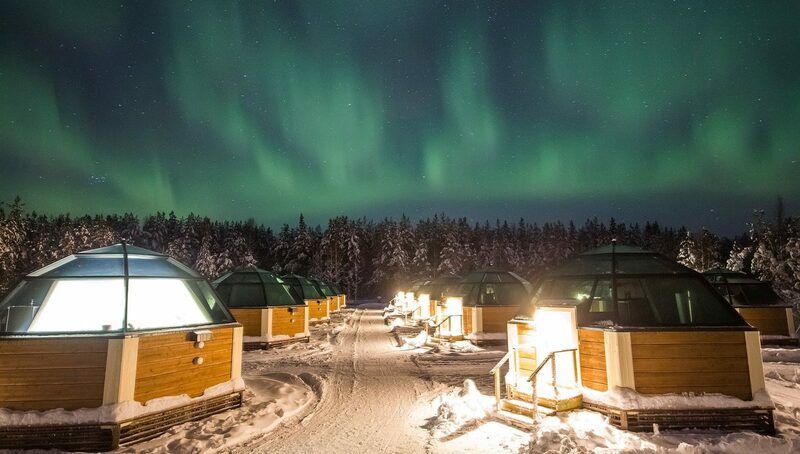 Northern Lights, the home of Santa Claus, and snow hotels are what you can experience when you go to Rovaniemi. If you visit Rovaniemi before or during Christmas you should definitely visit Santa Claus Village and SantaPark to get that extra Christmas feeling! Go on a reindeer sleigh ride or husky safari in the forest. There are different tours and packages you can choose from. At Arctic Snowhotel Ice Restaurant you can have a really “cool” dinner… because everything in the restaurant is made of snow and ice! Arctic Ocean Salmon or Roast Elk are two examples of what kind of food you can eat here. The restaurant Arctic Boulevard serves local food from the northern forests and seafood from Lapland’s lakes and the Arctic Ocean. They use seasonal ingredients and the menu differs depending on the season. Currently, you can find King Crab, Willow Grouse and Arctic Char on the menu. Fly to Helsinki and then you can reach Rovaniemi by domestic flight which will take just a little more than one hour. If you want to rent a car, the drive will take you about ten hours — if you want to explore more of Finland that might be an alternative option. Believe it or not, you can have a beach vacation in Scandinavia too! 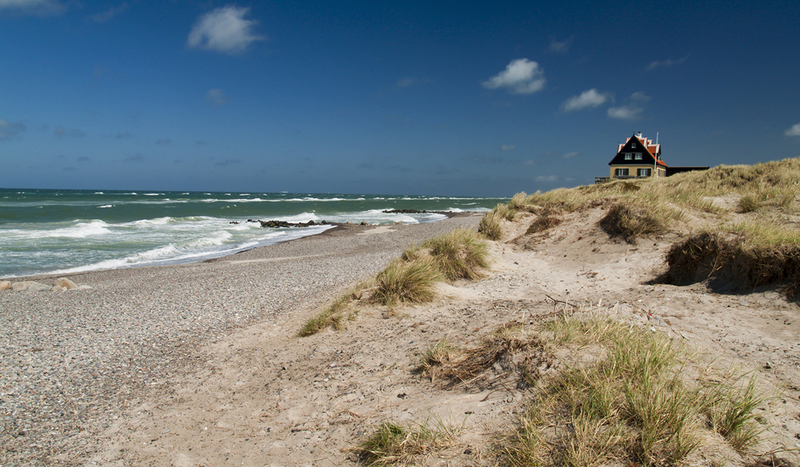 Skagen, a cute town in Denmark, is a perfect get-away from the big city life. North of this bay is where two oceans connect, Skagerrak and Kattegat. You can actually stand with one foot in each ocean, but you are not allowed to swim there. For swimming, there are a lot of beautiful beaches around the area. On the Skagerrak coast, the waves are bigger than on the Kattegat coast – If you have kids you might want to stay at the Kattegat side. Find your favorite part of the beach and enjoy! Skagen is famous for its seafood. A great place to try out the local fish is De 2 Have restaurant, which also comes with an amazing view. After your meal, you can take a relaxing stroll along the beach. Another great seafood place you should try is Pakhuset which is located at Skagen’s harbor. It has a café and a fine dining restaurant, and during summer they have live music every night. Enjoy skagen, tapas, fish soup, fried plaice, and more delicious fish dishes! Fly to Gothenburg (Sweden) and take the ferry over to Frederikshavn. The ferry from Sweden to Denmark takes about three hours and departs around 5 times a day. When in Frederikshavn take a local bus or train to Skagen which will only take about 40 minutes! 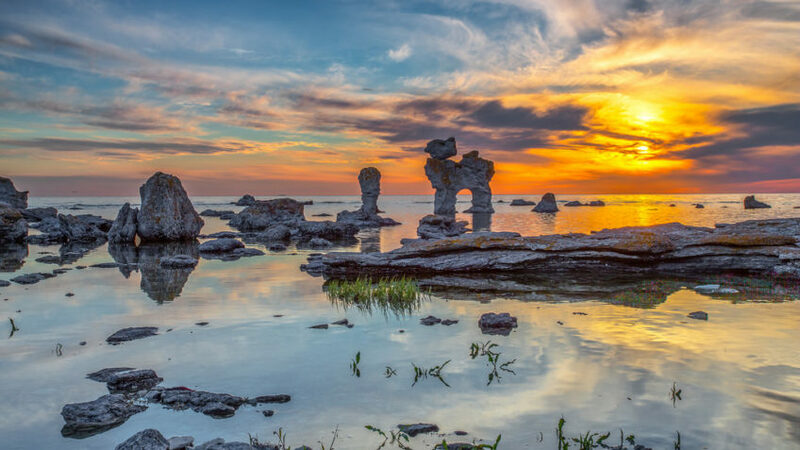 Gotland is a common vacation spot for Swedish people: we love to spend time on this cozy island during the summer to just relax and enjoy the nature. There are plenty of things to do on this island and the easiest way to go around is to rent a bicycle. Find more information on Gotlands official site. There are 92 churches and a lot of the original buildings from the middle age. Just walking around in Visby is an experience, as you will also see the medieval wall surrounding the city. If you like to party, we highly recommend planning your trip in the middle of July for Stockholmsveckan (Stockholm Week)s. It’s a week when a lot of Swedish people visit Visby to party, meet new friends and hang out. Another popular time to go there is during the Medeltidsveckan (Medieval Eeek), where you find tournaments, markets, theaters, fire shows and a lot more! There will be around 500 events during week 32, so if you are into history you should plan your trip to this week. If you want to eat delicious fish and seafood you should go to Bakfickan at Stora Torget in Visby. They serve dishes like fish soup, smoked shrimps, and Baltic herring. Kapitelhusgården is a medieval restaurant also in Visby. This dinner experience will take you back to the 14th century with fire shows, detailed costumes, and beautiful music. How to get here: Fly to Stockholm and then take a domestic flight to Visby which will take only around 40 minutes. The Geirangerfjord is included on the UNESCO World Heritage list and is known as one of the most beautiful fjords in the world. If you love hiking this is definitely a place for you! 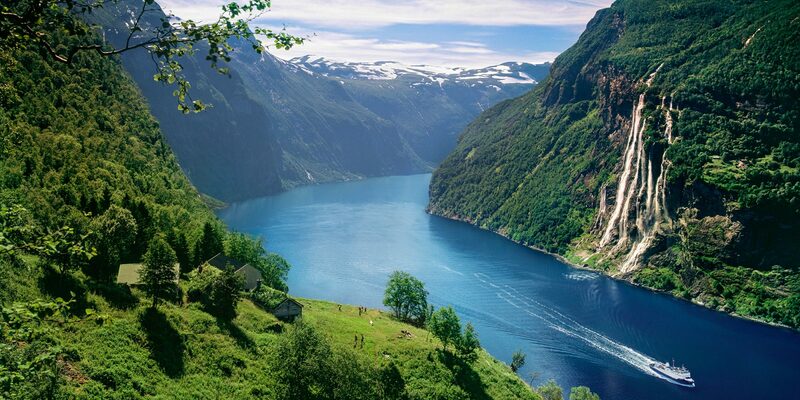 Click here for more info from VisitNorway about Geiranger. The incredible mountains and the clear water create an amazing panoramic view, which you can see while hiking in the mountains. There are easier trails for everyone to enjoy as well as harder ones for the more experienced hikers. The Geiranger waterfall walk has 327 steps along the massive Storfossen waterfall. After your activities, you can enjoy the local food at Westerås Restaurant. It’s a cozy restaurant with beautiful views of the fjord where you can enjoy the local salmon or how about their crispy waffles? …Or you can enjoy another local food restaurant called Brasserie Posten which is located right next to the fjord. Enjoy their tasty pizzas while watching the fjord! Fly to Oslo or Bergen and then take a domestic flight to Ålesund Airport. From Ålesund, the easiest way is to rent a car. The drive takes about 2.5 hours. Another option to go from Ålesund to Geiranger is by ferry. Johanna Skytt is originally from Linköping, she moved to Los Angeles 2016 to study Business & Management of Entertainment and Producing. She travels as often as she can and has previously lived on the Greek island Cyprus. When she has a free day she loves to explore LA, go to farmers market and watch movies.